Its model number and name are #036 / Animal Man. Character Bio - Bernhard "Buddy" Baker is a former movie stuntman who juggles a family life with his life as a traditional superhero. Animal Man has the ability to mimic physical and mental traits of nearby animals in an instant allowing him to thwart villains with passion. His close bond with animals sometimes proves more useful than his powers in tricky situations. 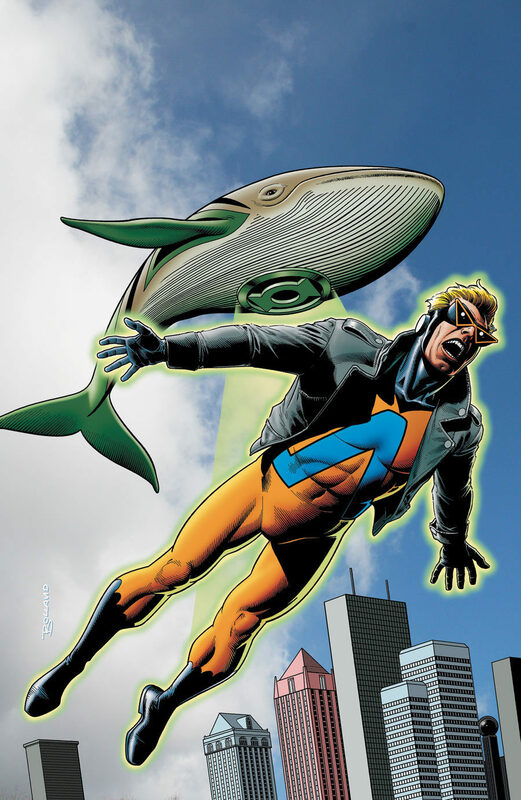 Animal Man has served on the Justice League of America and is an animal rights activist and environmentalist. As a Metahuman, Animal Man has these Metahuman Synergies. As an Adventurer, Animal Man has these Adventurer Synergies. As a figure with the Flying special power, Animal Man cannot be affected by aspects of certain special powers. Special Powers that Interact Differently with Flying special power. As a figure with the Super Strength special power, Animal Man cannot be affected by aspects of certain special powers. Special Powers that Interact Differently with the Super Strength special power. As a figure with the Super Strength special power, Animal Man interacts differently with certain special powers. Special Powers that Interact Differently with the Super Strength special power. As an Adventurer, an opponent's Impossible Man may add 8 to his roll for Shapeshifting Prankster if he chooses Animal Man. As a figure with the Flying special power, Animal Man interacts differently with certain special powers. Special Powers that Interact Differently with Flying. As a figure with a Special Attack, Animal Man can be affected by aspects of certain special power. Current Special Powers that Interact Differently with Special Attacks. Last edited by Ronin; October 14th, 2017 at 12:01 PM. Animal Man may add 4 to his Range number while on a water space and does not have to stop his movement when entering water spaces. Instead of his normal move, Animal Man may use his Kangaroo Bounce. Kangaroo Bounce has a move of 2. When counting spaces for Animal Man's Kangaroo Bounce movement, ignore elevations. Animal Man may bounce over water without stopping, bounce over figures without becoming engaged, and bounce over obstacles such as ruins. Animal Man may not bounce more than 16 levels up or down in a single bounce. If Animal Man is engaged when he starts to bounce, he will not take any leaving engagement attacks. After attacking, if Animal Man moved with Kangaroo Bounce, he may immediately use it one additional time. Figures without the Super Strength special power cannot roll defense dice against this special attack. If Animal Man inflicts a wound with this special attack, you may remove a Wound Marker from this card. Destructible objects are not affected by this special attack. Any time Animal Man would receive enough wounds to be destroyed by a normal attack, he instead receives one wound. Last edited by quozl; September 2nd, 2015 at 02:28 PM. I think the healing with Vampire Bat might be a bit much especially with Cockroach Durability. These powers look very fun though! I don't see a problem with it, as it won't happen an awful lot. He only reduces damage if he receives enough wounds to be destroyed, so if he's at full health and receives 3 wounds, he doesn't prevent any of that damage. Plus, Vampire Bat only works on figures without Super Strength and he has to roll a skull. Yeah, I'm not too worried about it unless playtesting shows it's a problem. He's also only got 4 life, 4 defense. I honestly think his points will go down before up. Instead of moving normally or after attacking with Animal Man's normal attack, you may move him up to 2 spaces that are up to 8 levels up or down each. When moving with Bouncing Kangaroo, Animal Man will not take any leaving engagement attacks. Is "Adventurer" the best class for him? Otherwise this design was hammered out a while ago, so... we're probably good. Yeah, a ton of discussion was already put in here, no power changes are needed. Instead of moving normally, you may move Animal Man up to 2 spaces up to 8 levels up or down. After attacking, if Animal Man moved with Kangaroo Boxing, he may immediately move up to 2 spaces up to 8 levels up or down. When Animal Man moves with Kangaroo Boxing, he never takes leaving engagement attacks. Adventurer really fits the character in my mind. What else did you have in mind Johnny? "Naturalist" or "Environmentalist" or something along those lines. I'm not really sure of the character, though. "that are up to 8 levels up or down each" is a stronger phrase here, IMO. He's not all over plants and stuff like somebody like Floronic Man. Naturalist and Environmentalist don't work. Adventurer is the most logical choice, he's always running around on various adventurers and his "base" is his house. He juggles a family life. Instead of moving normally, you may move Animal Man up to 2 spaces that are up to 8 levels up or down each. After attacking, if Animal Man moved with Kangaroo Boxing, he may immediately move up to 2 spaces that are up to 8 levels up or down each. When Animal Man moves with Kangaroo Boxing, he never takes leaving engagement attacks. Wow, 4 powers not including SS and Flying! I don't know anything about this guy, but wanted to post so it will come up on my User CP. I don't have too much time now, but will check in later. Yeah, he's pretty similar to Vixen, so hopefully the four powers are warranted here.